This luxury 5 star Bali accommodation offers an amazing location for a memorable honeymoon, romantic escape or couples getaway. Double-Six Luxury Hotel Seminyak features a selection of modern and spacious suites all fitted with luxury facilities and amenities. While staying at this luxury Bali resort guests will enjoy 24 hour butler service, access to the day spa, swimming pool, fitness centre and a selection of restaurants and bars. 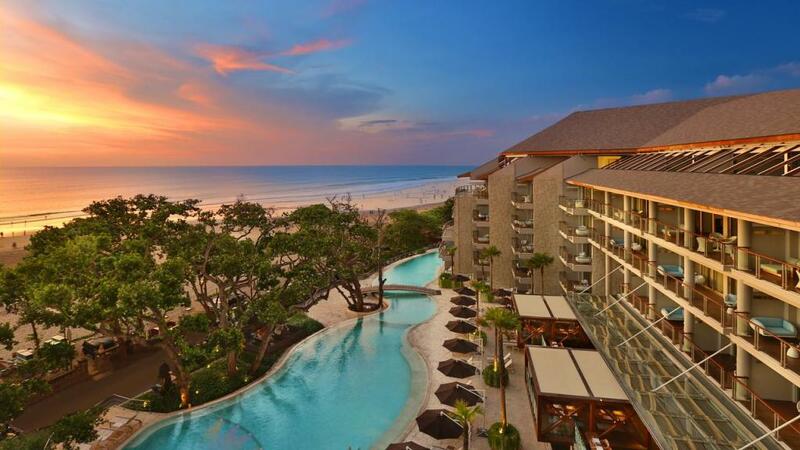 Luxury Bali Hot Offer: Up To 46% Off! Double-Six Luxury Hotel Seminyak is luxury beachfront Bali accommodation ideal for couples and honeymooners. With fantastic resort facilities such as a rooftop bar and beachfront lagoon swimming pool, Double-Six Luxury Hotel Seminyak is a intimate haven in trendy Seminyak. Amazing Bali Luxury Special: Up To 42% Off! Escape to beautiful Seminyak and indulge in 5 star hospitality. Double-Six Luxury Hotel Seminyak offers luxury suites nestled amongst its tropical gardens and beachfront location on Double Six beach in Seminyak. Couples will love the range of restaurants and bars on offer, not to mention the 120m swimming pool overlooking the beach.